Expressing full confidence in its future, Apple on Monday said it would use its massive cash balance of US$98 billion to issue dividends and repurchase shares. Apple will issue a quarterlydividend of $2.65 per share at some pointin the fourth quarter of its fiscal 2012 beginning on July 1. Thecompany also wants to repurchase shares to neutralize the impact ofdilution related to the employee stock option programs. The company has a substantial cash balance thanks to the success of theiPhone, the iPad and Macs, said Apple CEO Tim Cook on a conferencecall. Company growth will be helped as the tablet and smartphonemarkets continue to flourish, Cook said. 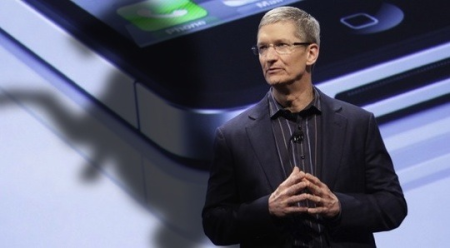 Apple’s huge cash war chest isthanks to the iPhone, says CEO Tim Cook. Apple will become one of the largest dividend payers with the newprogram, said Peter Oppenheimer, chief financial officer at Apple. Theprogram is also a way to attract new investors and expand theshareholder base, Oppenheimer said. The company expects to use $45 billion of its U.S. cash balance in thefirst three years of the programs. The company has $64 billion in cashoutside the U.S. and about $34 billion in the U.S. The company has already made some significant investments and thefuture is very promising, which gave the company confidence to initiatethe stock repurchase and dividend program, Cook said. Even after thestock repurchase, taxes and dividends, there will be plenty of cash onhand to run the business and invest in strategic areas, Appleexecutives said. “That’s plenty of cash to run the business,” Oppenheimer said. Therepurchase program is planned for the next three years, and thecompany’s dividend plan is subject to declaration by the board ofdirectors, and will be continuously evaluated. The company has been investing cash in research and development,acquisitions, opening stores andto build out the supply chain, Cooksaid. Apple more than doubled its profits in the first fiscal quarter of 2012that ended on Dec. 31, which was the company’s first full quarter underCook, who took over from Steve Jobs late last August. Appleearned anet profit of $13.06 billion, growing from $6 billion in the year-agoquarter, while revenue grew to $46.33 billion from $26.7 billion a yearago. Apple sold 37.04 million iPhones in the quarter, up 128 percentfrom the same quarter a year earlier, and 15.43 million iPads, up 111percent. Mac sales totaled 5.2 million units, up 26 percent. The iPhone market will continue to grow along with smartphoneshipments, Cook said. IPad shipments totaled 55 million last year andwill also increase, Cook said, citing Gartner’s projection of tabletshipments reaching 325 million by 2015. “We believe the tablet market will surpass the PC market in size. It’sa matter of time,” Cook said. The programs will have no future impact on the company’s product plans,but are a great move for the company in the long run, said Shaw Wu,senior research analyst with financial analyst firm Sterne Agee. Apple’s stock price was at $592 on Monday morning, shy of the $600 markit passed last Thursday. Canaccord Genuity technology analyst MichaelWalkley last week raised the stock price target for Apple to$710 afterprojecting the new iPad, which became available last Friday, will helpthe company maintain a dominant share in the tablet market. Walkleywasn’t immediately available for comment. Will Windows 8 tablets just confuse consumers?